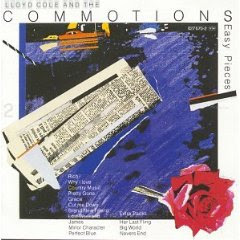 I swear, the real title of this blog should NOT be "The Rare Stuff Of Wordy English Singer-Songwriters", but for my next post I wanted to offer this rare-ish CD, the British release of the Commotions' second album, Easy Pieces. Though it doesn't have the reputation of their debut, Rattlesnakes, it actually was a higher-charting album in England at the time of its release, and probably in the US too, due to 2 videos being shown on MTV. I asked Lloyd on his website Q&A page whether there would be a deluxe reissue of this album as there was with Rattlesnakes, and he said he seriously doubted that would ever come to pass. To the neurotic-folk-rock sound of the Commotions, this album added more elaborate production by Clive Langer and Alan Winstanley (who had recently worked with Elvis Costello after making their names producing Madness), including some not-obnoxious horns on the quasi-hit Lost Weekend, and some soul singers backing up the other single, Brand New Friend. I think my favorite is the atmospheric final cut of the original album, Perfect Blue. The three bonus tracks are Her Last Fling, Big World, and Nevers End. Hope y'all enjoy. And truth be told, this blog is gonna be kinda heavy on the singer-songwriters. Not just Brits, though! Huh? I'm not knocking anything! I love singer-songwriters, and I love Lloyd Cole, otherwise I wouldn't be posting this album! Really great. I own this cd in fact and it is somehow damaged or past expiration date and won't play. So it was really important to me to have all the tracks.